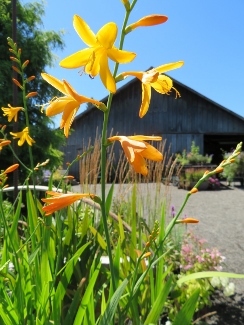 Joy Creek Photo Archive (c) all rights reserved Noted for its large flowers and earlier bloom time, Crocosmia 'George Davidson' has been in the trade since 1900. Individual flowers measure three inches across starting from tangerine-colored buds that grow softly golden as they open. The many-branched stems provide a bounty of flowers. Blade-like, mid-green leaves enhance this sunny perennial.